A weekend of workshops, ensemble playing, sessions, dancing, a concert and more! Three contrasting international tutors – Magnus Holmström from Sweden, Vicki Swan from the UK and Johannes Mayr from Germany – will between them offer a whole range of tuition on a variety of subjects. You can expect Swedish music, British music, European music, plus technique and ensemble classes. 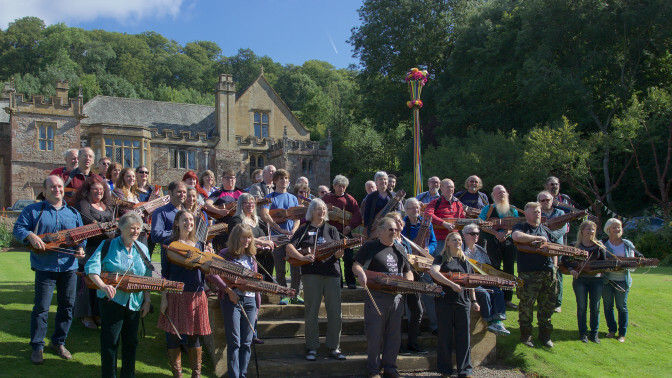 Master Nyckelharpa maker Olle Plahn will be back to help with repairs and maintenance, and Jonny Dyer will also be on hand to co-host the weekend with Vicki. Players of all abilities are welcome, with limited places available for complete beginners wishing to borrow an instrument. Come and explore a range of repertoire, and meet, play and socialise with other players and enthusiasts! The weekend is for players of all abilities to explore a range of repertoire, and to meet, play and socialise with other players! There are limited spaces for complete beginners who wish to borrow an instrument – please book early. Beginners may also find the April 2016 ‘Nyckelharpa for Beginners’ course at Halsway Manor useful. Vicki Swan (UK) graduated from the Royal College of Music on double bass, specialising in performance. Well known on the British folk scene she is a full time folk musician performing on nyckelharpa, bagpipes and singing. Being half Swedish the nyckelharpa was a natural choice to add to her armory of instruments and is now leading the development of the nyckelharpa in Great Britain with the UK Nyckelharpa Project and spearheaded the newly formed UK Nyckelharpa Society. In addition to various duo recordings Vicki has recently published the ‘British Session Tunes for Nyckelharpa’ and also a book of Duets in the Swedish Style. Vicki is a qualified teacher, specialising in instrumental teaching and has a masters in Education (specialising in distance tuition on the Scottish smallpipes) and composes and arranges music for the nyckelharpa and other ensembles. She was a member of the ENCORE (European Nyckelharpa Co-operation – Orchestral Experience) in 2013 and a tutor on the International Nyckelharpa Days in Germany in 2014 and 2105. Magnus Holmström, Sigtuna (Sweden), is a professional nyckelharpa player and an experienced teacher. He studied at the Eric Sahlström Institute in Tobo and at the Royal Collage of Music in Stockholm. In 2004, he won the World championships with “Gammelharpa” (old style nyckelhapra) and in 2006 both with “Gammelharpa” and modern nyckelharpa. In 2006, he also won the award; “musician of honour” at Burträsksvängen and in 2008 the Bror Hjorth Scholarship. He is a regular tutor at the International Nyckelharpa Days in Germany. Johannes Mayr, Breitscheidt (Germany) is a very active and versatile musician performing for the last 20 years on accordion, nyckelharpa, organ and double bass. Originally coming from a Bavarian-Swabian folk-background he feels comfortable in many different European folk-styles. Johannes performs with Cassard (Traditional music of tomorrow), La Marmotte (folk celtique) and Bordunrot (old and new folk music) in addition to a solo program with his own compositions. He also works as a choirmaster and teaches a variety of workshops. A graduate of the European Nyckelharpa training and has been a tutor on the International Day of Nyckelharpa in Germany. Johannes is also a nyckelharpa maker and performs on his own instruments.